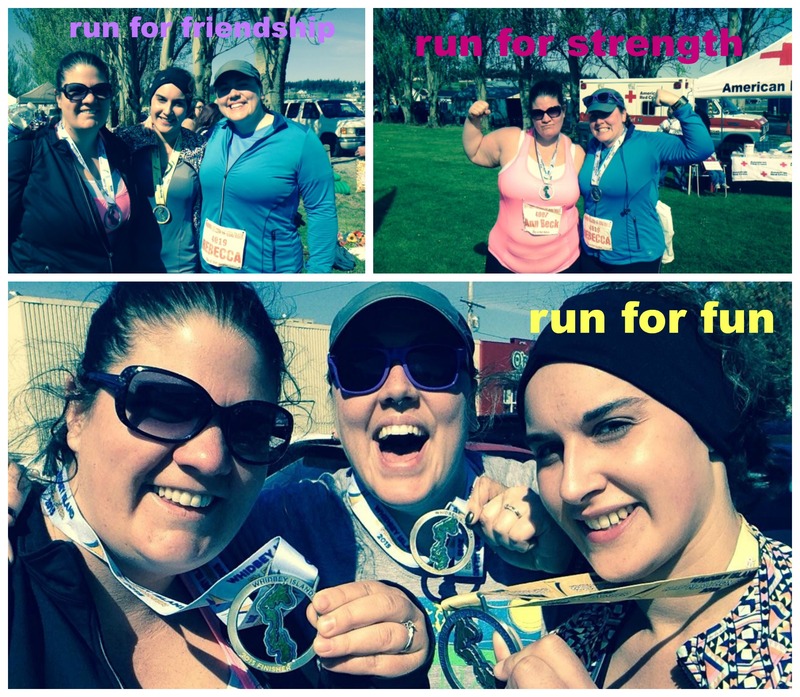 April Race Part 3: Whidbey Island 5K – PR!!!! The last time I participated in this race day was 2013 when I ran my first half marathon. Six days after a very bad ankle sprain, I braved torrential rains and blustery winds to hobble through my first 13.1 miles. It was an accomplishment that came with mixed emotions, but I am still proud of my ability to persevere through that race. I felt this year was to be a triumphant return to Whidbey even though I was running the 5k and not the half. Saturday after Fun with the Fuzz I was just feeling good. I felt something in my bones and my muscles and my mind that all told me I was stronger and more prepared for Whidbey than any other race I’ve completed. I can’t explain except to say I just knew I was on the precipice of something. We made a ladies weekend of the two back-to-back races and headed to Whidbey for some pre-race hijinx – which mostly consisted of snacks in the hotel, thai food for dinner, a beer at a local bar “Off The Hook”, hot tubbing, and some comical commentary as we flipped through channels and snuggled in bed. We spent that last mile almost side by side. We didn’t talk, we just ran – each knowing we couldn’t let the other person down by slowing or walking. As we turned the corner to the home stretch she looked over to me and with a determined smile said, “Turn it on!”. I knew just what she meant. We both gave it everything we had and sprinted, pushing our legs to move faster and our lungs to pump harder. We crossed the finish line and chatted for a few minutes. I learned she was visiting from Denver and was racing with several friends that day (in various other distance races). We thanked each other and talked races, running, and generally basked in the glow of what was most certainly a PR for us both. I will not soon forget her kindness and our race together. I checked my watch and was blown away. Prior to this race, my race PR was 37:54 from 2013. I have beat that a handful of times in training runs, but never by much. I was aiming for low 37:?? and even dared to day dream about seeing 36:? ?.It has been a while since I ran a race all-out and I am aware my training over the last several months has been more consistent that ever. I know I’ve talked about my pace in a few posts recently and how I’ve been seeing an uptick in my pace and generally feeling more stable in my runs. I just haven’t seen anything like this. I finished Whidbey 5k averaging 11:20/mile (WHaaaaAAtt??) in 35:12. Thirty five minutes and twelve seconds. This is almost 3 minutes faster than my previous PR (exactly 2:42 if you’re counting. I know I am.). Even typing that, I cannot believe it. I am still riding my race and PR high. While I am not counting on every race being faster than the previous – heck, it will be a while before 35min 5k is a regular thing for me – but most importantly, I am more motivated than ever to keep up my consistency and to continue working on my running practice. 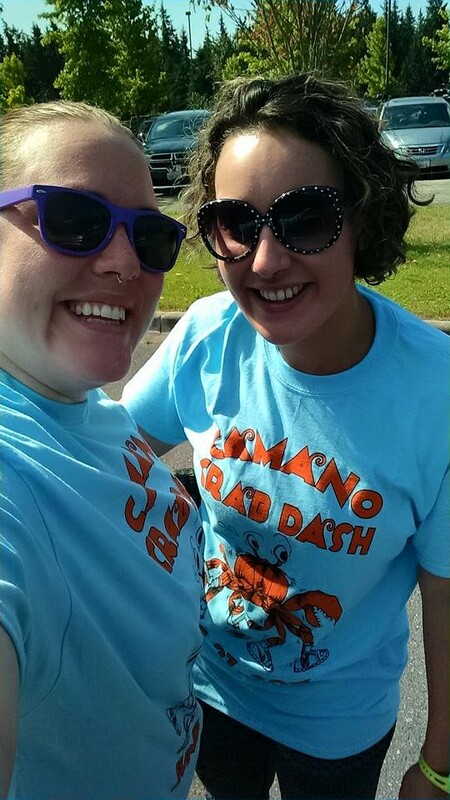 Sorry this post is out of order, but I forgot to post about my March race! 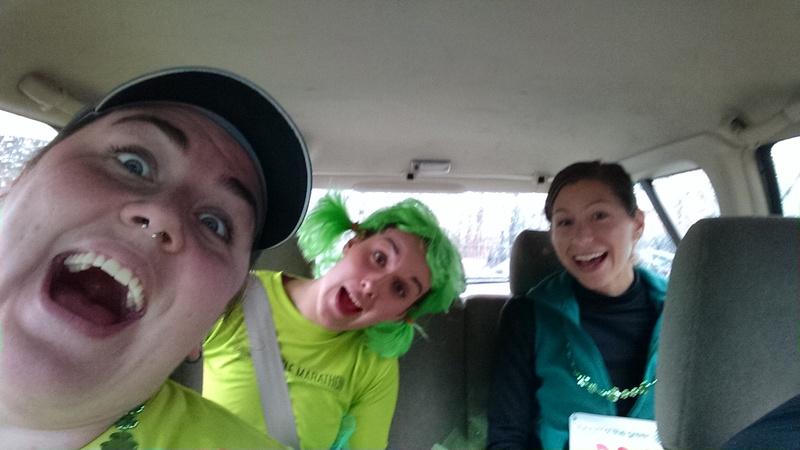 I ran the Running ‘O The Green 5k with my pals. MT and I busted out our tutus from a few years ago and I made two new tutus matching them as close as I could to the older ones. Mr. didn’t get his own but I don’t think he was too disappointed. The weather was rainy and blustery – everything you expect from a March day in the Pacific Northwest. MT and Mr. ran the 8K while the other three of us stuck to the 5k. It was a very populated race and it was a reminder of how spoiled I am to live in an area where I’m able to participate in so many small races. I am typically in the last 10th of finishers at these smaller races and while sometimes that affects my mental pep-talks (“there probably won’t even be anything good left at the trough” or “I feel like everyone is waiting on me!”) I usually have lots of breathing room and don’t have to think much about navigating other runners. We got stuck playing leap-frog with a runner wearing entirely too much patchouli which was unpleasant to say the least (btw, “any” is the amount of patchouli that should be considered too much, if you are wondering).